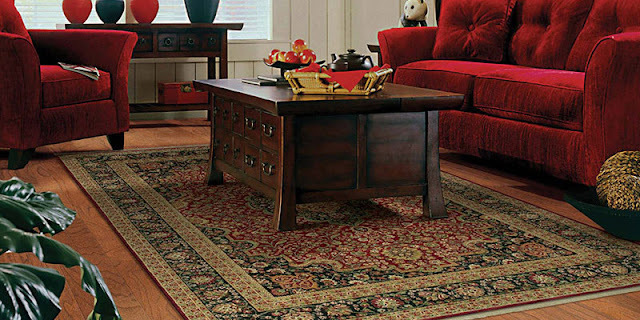 Indianapolis homeowners are discovering that area rugs are one of the most versatile flooring options available. With such a wide variety of designs, colors and shapes to choose from, there truly is an area rug for any room or space in your home. You can even create a custom area rug at Indianapolis flooring store Kermans to get exactly the shape and size you need. Let's review five great reasons you should consider an area rug for your home. A living room or family room grouping of furniture can seem to float in a room. 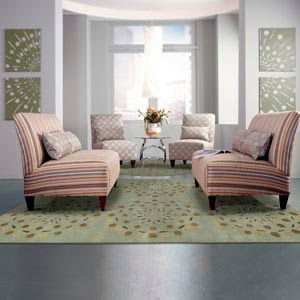 Add an area rug and you'll visually anchor the furniture, changing the whole look of the room. An area rug makes this same impact beneath a dining room table or strategically placed in a bedroom. An area rug changes the focal point of the room and adds a visual divider that makes a space feel more cozy and comfortable. An area rug is literally a work of art - just one that is designed to be walked upon! A bold patterned area rug creates a focal point for the room's decor. An area rug in just the right shade can tie together the colors of your drapes and furnishings. You can also add an area rug in a contrasting color to make your furnishings or wall color really pop. Area rugs add a lot to a room's design! Lay an area rug on a hardwood floor and you instantly increase the warmth and comfort of a room. Add an area rug next to a bed and you've given yourself a layer of cushion and softness to step on first thing in the morning. Sometimes a long stretch of wood or tile flooring can be slippery underfoot - especially if you have little ones running around in socks. An area rug adds a bit of traction right where you need it. And it does so beautifully and with style! Open floor plans and great rooms are a fixture in many homes. These spaces have many advantages for homeowners but sometimes these large open areas aren't advantageous for noise levels. If you have tile or hardwood floor in a large room, you've likely noticed that sounds carry and can get out of control. An area rug adds a layer of sound absorption that is surprisingly effective at quieting a room. Layering and patterns are two big trends in flooring. Area rugs are a cost-efficient and fun way to add these trends to your home decor. Area rugs can be installed on any type of flooring - yes even carpet! You can add a pattern, incorporate a contrasting pattern, layer different colors to bring depth to your home design - and so much more! Practical. Versatile. Beautiful. Area rugs are an excellent addition to any home. Need some help deciding just which area rug best meets your needs? Schedule a free design consultation at Kermans Indianapolis flooring store. Our design staff is available to discuss your specific needs and make recommendations that fit your home, lifestyle and budget.